Graphics courtesy of Andy Veh. Winter in the Northern Hemisphere is depicted on the left as the Earth’s axis points away from the sun. Summer in the Northern Hemisphere is depicted on the right as the Earth’s axis points toward the sun. Since we’re just past the equinox, I figured I’d talk about the reasons for the seasons. One could just say that it’s warm and thus summer when we’re close to our sun, and cold and thus winter when we’re far away. That explanation makes sense, but it’s wrong. It’s not correct because Earth has its closest approach to our sun at 91.4 million miles around Jan. 3, and is farthest at 94.5 million miles around July 4 (the average distance being 93.1 million miles). 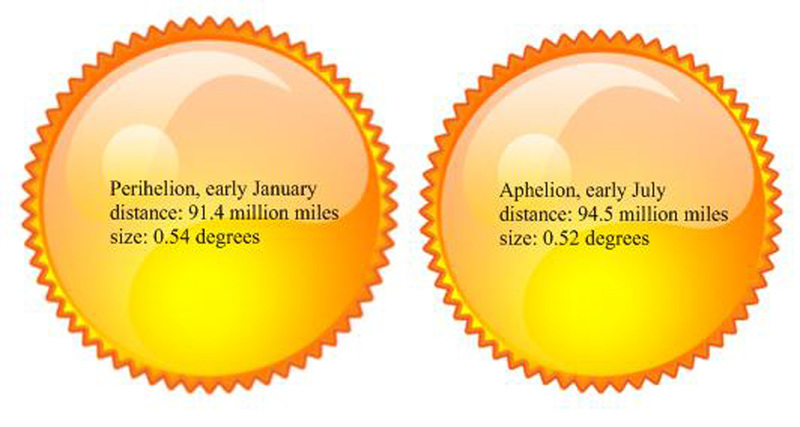 We can check this in any good astronomy book, Google “perihelion and aphelion,” or we can make our own observations by taking photos of the sun in early January and in early July. On second thought, I don’t recommend that because it’s dangerous. Instead, visit http://www.perseus.gr/Astro-Solar-Scenes-Aph-Perihelion.htm or do a Google image search for “sun size perihelion aphelion.” On first glance, you don’t see any difference in size, thus the same Earth-sun distance during either month. Ergo, that can’t be the reason for the seasons. On second inspection, the sun’s size is ever so slightly larger in January, meaning the Earth is closer to it, which is contrary to the seasons. This is caused by Earth’s elliptical orbit, which perpetuates this wrong explanation. However, as explained, the difference is minimal and even placed in the wrong season. The Earth’s ellipse around the sun is virtually circular, giving rise to very little differences in distance. Another strike against the distance hypothesis is that the Northern and Southern hemispheres have opposite seasons at the same time. The Australian Open tennis tournament, always played in January, has players battling the typical 90- to 110-degree midsummer temperatures, and the World Cup in soccer will be played in June 2010 in South Africa, with typical 50- to 70-degree midwinter temperatures. South Africa has mild temperatures in winter because it’s closer to the equator, just as Texas and Mexico are. A third strike against the distance hypothesis is that it doesn’t explain what we actually observe throughout the year. In winter, the sun makes a small, low arc across the Southern horizon for a short time, while in summer it makes a large, high arc across most of the sky for a long time. We can see these different-size arcs extremely well in Alaska, and also notice a big difference between six hours of daylight in winter and 19 hours in summer. Again, we can’t explain these very familiar observations by invoking anything about a perceived change in the Earth-sun distance. Instead, seasons must be explained differently. It’s the tilt of Earth’s axis that produces them. In order to understand seasons, model them by using a bright lamp and an Earth globe in a darkened room (note that all globes are manufactured with the correct 23-degree tilt). Position the globe about 3 feet from the lamp, so that the northern part of the axis is tilted toward the lamp and also points at the top shelf of your bookcase. That top shelf shall substitute for Polaris, the North Star, toward which Earth’s axis always points. Notice that the sun (the bright lamp) shines more directly onto the Northern Hemisphere. The sun appears higher and its radiation is more intense. When you rotate the globe, we get long hours of daylight and, thus, long hours of heat. Therefore, it’s summer. At the same time in the Southern Hemisphere there’s a low sun angle and short days. Now make the Earth orbit halfway around the sun with the axis pointing at the top shelf and keeping a distance of about 3 feet. On the opposite side, the Earth’s axis is now pointing away from our sun. We get sunlight under a much more shallow angle, which produces a lower arc. When you rotate the globe, you can see that we get few hours of daylight and, thus, few hours of heat. Therefore, it’s winter. Notice that the Southern Hemisphere gets more direct sun and longer days, so it is summer for them. Fall and spring are in between these extremes. Andy Veh is a professor of astronomy at Kenai Peninsula College. A message to Jenny…on her story about Marge Mullen. You did a lovely job making sense of late night ramblings from one of your interviewees….and a terrific job on this story…. But does the distance between the Earth and the Sun in combination with the tilt of the Earth’s axis mean that summers in the Southern Hemisphere are hotter than in the Northern Hemisphere, because the distance is the shortest at the same time that the tilt means it’s summer?